DNA extraction is one of the most modern of the biological sciences. Scientists and doctors use DNA extraction to diagnose many medical conditions to genetically engineer both plants and animals. DNA extraction can also be used to gather evidence in a crime investigation. DNA extraction can be used to modify plants, by isolating DNA from organisms with desirable traits, such as resistance to pesticides, and injecting them into the genome of the plant. When the plant reaches adulthood, its seeds will inherit the modified genes. DNA extraction, can also be used to alter animals, from making them glow-in-the-dark to cloning them. A number of pharmaceutical products, including hormones and vaccines are made using DNA extraction. It is also used to verify people’s identity, both to determine genetic relatives and to investigate suspects of crimes in which genetic material was left at the scene. DNA extraction is integral to the process of genetic modification of plants. Many agricultural companies use genetic extraction to isolate DNA from organisms with desirable traits, which they then transplant into the plant’s genome. This is done by taking a sample of the organism, extracting the DNA, and then cloning it to make thousands of copies of the single gene that they are interested in. The scientists then alter the gene to make it ready to work with the rest of the plant’s DNA, and then insert it into the nucleus of some plant cells. The plant cells are grown into adult plants, and their offspring seeds all have the genetic modifications. An example is number of lines of seeds manufactured by the Monsanto Corporation that are immune to the herbicide Roundup. By making the crops (beets, for example) resistant to Roundup, that particular herbicide can be sprayed on fields to kill weeds, but not affect the beet crop. DNA extraction is also the first step in genetic engineering of animals. Genetic engineering of animals is a very broad field that ranges from editing a single gene to transplanting genes from one animal into another. For example, a Taiwanese research lab transplanted jellyfish genes into pigs, causing them to glow in the dark. On the most complex end of the spectrum of animal genetic engineering is cloning, a process by which genetically identical animals can be made. DNA extraction is used as the initial step in manufacturing a number of pharmaceuticals. Pharmaceuticals made via recombinant genetics include the Hepatitis B vaccine and human growth hormone (hGh). In addition to a number of other hormones created using DNA extraction, one of the most widely used is insulin. 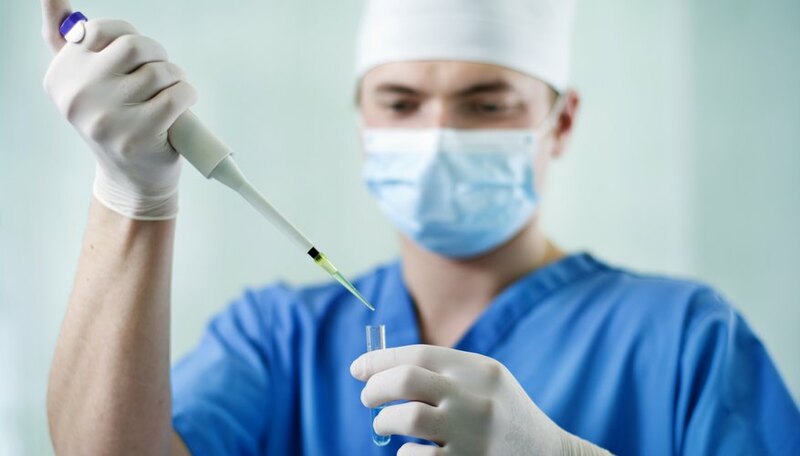 Diagnosis of certain medical conditions can often be made from DNA extracted from a patient. Conditions that can be diagnosed by genetic testing include cystic fibrosis, sickle-cell anemia, fragile x syndrome, Huntington's disease, hemophilia A, Down's syndrome and Tay-Sachs disease. In addition to diagnosing existing diseases, geneticists also commonly test whether a person is a carrier of a particular genetic condition but does not have any symptoms of the disease. A well-known use for genetic extraction is genetic fingerprinting, a process that matches genetic material from an individual with other genetic material available. One example is paternity testing, to determine someone’s biological father. Another common use for DNA extraction in identity verification is for forensic purposes. Genetic material from an individual can be compared to genetic material at a crime scene, such as blood, for example. Genetic verification has worked both to place a person at the scene of a crime and to exonerate people falsely convicted of a crime. Wen, Ma. "Uses of DNA Extraction." Sciencing, https://sciencing.com/uses-dna-extraction-5344428.html. 04 May 2018.